Cricket Bell. Cricket. Seriously, just stop what you’re doing and go read this, so you can become acquainted with Cricket Bell. I love that name, Cricket Bell. I have to say that I love Cricket more than St. Claire. And while I loved Lola and the Boy Next Door, I did enjoy Anna and the French Kiss more. Which I wasn’t expecting, since so many people are way more in love with Lola than they are with Anna. Let’s talk about these people. Max, Lola’s current boyfriend, was hot in the beginning, and very nice despite the restrictions put on Lola in dating him. But I knew with me at least, he would stand no chance against Cricket. I’m sorry but I can’t stop saying his name. Cricket. I love it. Anyways, Anna and St. Claire are back, and it was fun reading about them again whenever they popped up. Lindsey is an awesome best friend, ready to do anything for her, including kicking Cricket where it counts. Her fathers, Nathan and Andy provide many funny moments. I didn’t like Cricket’s sister initially, but she suddenly redeems herself somewhat at one point in the book. Kind of late, and half-assed I think, but it works. The only character I didn’t really like was Lola’s mother. I didn’t see much point to having her in the story in all honesty. The only reason I don’t love Lola as much as I love Anna is because the writing, while still pretty awesome, didn’t blow me away with humor and the intense aching and longing like it did in Anna until around the last 100 pages. The romance was there, but it didn’t really make itself felt until the end. Even so, Stephanie Perkins still manages to reach inside the mind of a young girl’s daydreams about love and gives the story life. I’ll definitely be rereading this soon. 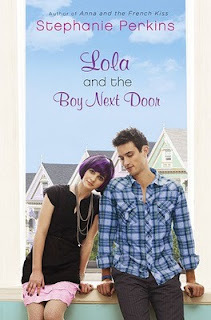 If you loved Anna and the French Kiss, make sure you read Lola and the Boy Next Door as well! But remember, even though Anna and St. Claire are present, Lola is still it’s own book and should be thought of as such. Now to just settle in for the year long wait for Isla and the Happily Ever After. I can’t wait to read this one although I haven’t read Anna yet. I just got it but I wanted to dedicate this month to paranormal, halloween-related books. I promise, I’ll get to it soon! I definitely want to see what the hype is all about. Thanks for the review! Great review. I felt pretty similarly… I loved loved loved Cricket, but I liked Anna & the French Kiss better. Lola wasn’t as funny (to me), and I thought she was harder to relate to. But still a fun read. I liked how Anna & St. Clair were in the book but didn’t steal the show.